It has been difficult to determine what happens to residents, and houses, following foreclosures. With regard to the residents, there had been reports suggesting many became homeless or doubled-up with family or friends. For tenants of rented houses subject to foreclosure, concerns that they would be evicted led to legislation in 2009 protecting tenants. A recent study by Federal Reserve economists Raven Molloy and Hui Shan, based on credit bureau data, sheds new light on the fate of homeowners subject to foreclosure. Their data set includes the start of the foreclosure process, but does not show the completion. The data show where the individuals in the household lived two years after the foreclosure was initiated. Molloy and Shan find that half of the households were still in their homes after two years, reflecting the lengthy foreclosure process. There was little evidence that those subject to foreclosure moved in with parents or were otherwise doubled-up. The most common trajectory of those who were no longer in the foreclosed home was movement into a rented single-family home. Other data sources don't offer much information about the effect of foreclosures on households. Government surveys such as the Current Population Survey and the American Housing Survey ask people who moved the reason(s) why they did so, but foreclosure is not among the explanations listed. Credit bureau data have great potential, but are not available to most analysts. At a presentation in November 2010 by Robert Avery, another Federal Reserve economist, regarding plans for a national mortgage database using credit bureau data, I asked whether that data set could potentially be used to track people after foreclosure. His reply: "Your ex-wife may not know where you are, but the credit bureaus will." It would seem that it ought to be easier to find out what happens to properties than what happens to people after foreclosure, but that's not simple either. There is information about how many become REO (real-estate owned by financial institutions), but not much about what happens after resale. Surveys of real estate agents by the National Association of Realtors or private firms such as Campbell Communications indicate that REO properties are disproportionately sold to investors, apparently for use as rentals. There has been a substantial transfer of single-family housing into the rental market. It seems logical that much of that movement is connected to defaults and foreclosures. I thought the relationship could be illustrated by a correlation between state-level defaults and foreclosures and relative growth in the number of single-family rentals, but the states with the greatest increases in single-family rentals, as measured by the American Community Survey, were not the states where the largest shares of mortgages have been in default and subject to foreclosure. So much for that idea. Although foreclosures no doubt often result in rentals, there are too many other factors to explain shifts in the housing stock to rental use entirely based on defaults. An article in the Wall Street Journal on Friday Jul 22 indicates that the government is looking for ways to move foreclosed homes into the rental market. The market has already moved in that direction, and has done so despite, rather than because of, government policy. As the recent 2011 State of the Nation's Housing report from the Harvard Joint Center for Housing Studies documented, between 2007 and 2009, there was a net shift of 1.8 million existing housing units (mostly single-family) into the rental market, far exceeding additions to the rental supply from new construction. Under an existing Neighborhood Stabilization Program, HUD already provides grants to local governments and nonprofits to buy abandoned or foreclosed properties. In announcing a "First Look Program" whereby grantees would have a right of first refusal to purchase foreclosed properties, HUD complained that local governments and nonprofits "often find themselves competing with private investors for real-estate owned (REO) properties." Apparently HUD believes that private investors want to buy foreclosed properties in order to vandalize them or establish crack houses, rather than to perform—without public money—essentially the same functions expected of public and nonprofit owners. There may be some special purposes to which housing owned by local governments and nonprofits can be channeled that wouldn't be priorities for private investors. The current market situation may provide opportunities to acquire properties for those purposes. But that doesn't mean that purchases by private investors should be regarded as a nuisance or threat, rather than as an essential element in the restoration of market stability and in the provision of places for people to live. Moreover, most NSP grants don't serve the sorts of unique constituencies that would not be found in private for-profit rentals. Delays and restrictions on foreclosures don't help to preserve the housing stock or stabilize neighborhoods. The supposed malpractices of lenders initiating foreclosures overwhelmingly consist of technicalities in the handling of paperwork, not unwarranted actions against faultless borrowers. The sooner that properties with defaulted mortgages--many of which are vacant and decaying—are returned to the market, the better, but government policies are prolonging the agony. The Federal Housing Administration (FHA) insures mortgages for owner-occupied single-family properties (which, in the mortgage market, means properties with one to four units). There is also FHA insurance available for mortgages on multifamily rental properties. But FHA generally doesn't insure mortgages for single-family rentals. Rather than putting the federal government into the business of owning and operating single-family rental housing or creating a new program under which the government would control use of foreclosed properties, how about just providing FHA mortgage insurance for single-family rentals. This should be done, however, with careful underwriting and appropriate (i.e., higher) mortgage insurance premiums. For the housing market to come back into some approximation of balance will require less supply and more demand. Additions to supply from new construction have been reduced to a trickle, but demand growth, until recently, has been far below underlying demographic potential, prolonging the imbalance. There are finally signs that demand is recovering. Although demand is frequently assessed based on home sales, the more fundamental expression of demand is the net formation of households. A household is defined as an individual or group occupying a housing unit, so the number of households is, by definition, equal to the number of occupied units. If the adult population in each age bracket maintained a consistent tendency to form independent households, the growth in the adult population would translate into about 1.2 million households per year. Beginning in 2007, as the economy headed toward recession, however, the rate of increase in the number of households fell sharply, to about 500,000 per year. That slowdown was partly caused by lower net immigration, but it was mainly due to various forms of doubling-up. Doubling-up included more people living with roommates, partners, other families, etc., but the most common manifestation was an increase in the share of young (and not so young) adults living with their parents. Among the population aged 25 to 29, for example, the share living in their parents' homes rose from about 16 percent in March 2007 to 18 percent in March 2010, while the share in that age group who were household heads declined from 47 percent to 44 percent. With about 20 million people in that age bracket, the decline in the "headship rate" of 3 percentage points translated into 600,000 fewer households. Across all age groups, changes in headship rates from 2007 to 2010 reduced growth in the number of households by about 2 million during 2007 to 2010. There are a number of conflicting measures of the number of households, none of which is very precise, and many of which are only available after a substantial lag. The most current information is contained in the monthly Current Population Survey, which is conducted primarily to measure unemployment. The household totals from the monthly CPS are not shown in any standard reports, although a variant, from the CPS-related Housing Vacancy Survey, is available with a few months lag. I tabulated some of the CPS monthly data through May 2011, and the data indicate a rebound in the rate of increase in the number of households in recent months. From May 2010 to May 2011, it appears that there was an increase of about 1.6 million, and the average number of households for the first 5 months of 2011 represented an increase of 1.3 million from a year earlier. The CPS data do not show that there has been a decline yet in the share of young adults living with their parents. The increase in headship comes instead from more people living alone rather than in couples or groups. In the 1970s, a surge in divorces contributed to an especially large increase in the number of households, and the recent pattern is somewhat analogous. The divorce rate hit a peak in 1979, however, and is now lower. You can't get divorced without first being married, and that prerequisite has been less frequently met. Over time, but especially in the last few years, the share of people who have never been married has grown, and recent growth in single-person households has come largely from never-married young adults. There's a lot of noise in the monthly CPS numbers, but if the recent data are not just driven by random sampling error, by deficiencies in Census Bureau population estimates and weighting schemes, or by programming mistakes on my part, it suggests continued declines in vacancy rates and stabilization in the overall housing market. If growth in the number of households comes mainly from single-person households, however, that implies demand for smaller, multifamily rental housing, in urban settings, rather than a near-term revival in demand for suburban detached homes. Household surveys do not actually count the number of households—or the number of employed or unemployed people. The surveys measure proportions of those surveyed and those proportions are multiplied by estimates of the number of housing units or of the population in different categories. Most estimates of the number of households, including those from the ACS, AHS, and HVS, are calculated by multiplying an occupancy rate by the estimated total housing stock. The CPS data discussed here are instead tied to estimates of the population. If the survey finds that 45 percent of non-Hispanic white women aged 30 to 34 are household heads, and the estimated population for that category is 10 million, that means 4.5 million households. Adding up the various population categories then produces an estimate of total households. (That's an oversimplified, but hopefully instructive, description.) Whether estimates based on population controls or housing stock controls are superior is debatable. The population-based estimates are closer to the household total in the 2010 census, but the decennial census data tend to count some vacant units as occupied. The monthly CPS is not identical to the annual March CPS supplement that collects more detailed demographic data. The latest annual data are for March 2010 (actually collected February to April). The annual data for March 2011 won't be available until September. A comparison of the change in the housing stock between 2000 and 2010 , as reported in the decennial census, with the number of units built over that period indicates losses from the stock averaged 94,201 housing units, or 0.08 percent of the stock, per year. If only 0.08 percent of the housing stock were lost each year in the future, the majority of today's homes would still be standing and habitable 850 years from now. The total number of housing units as of April 1, 2010, was reported as 131,704,730, compared to 115,904,640 on April 1, 2000. The increase of 15,800,090 compares to 16,742,100 new units produced (15,424,800 conventional units completed and 1,317,300 mobile homes placed). The residual, 942,010, is the implied number of net losses. For the period from 1990 to 2000, the comparable numbers (115,904,640-102,263,678 vs 13,359,200+2,854,029) translate into an implied net loss of 2,572,267. The small number of apparent net losses is probably due, at least in part, to measurement problems. There could have been fewer units missed, or more units double-counted or erroneously included, in 2010 than in 2000. An analysis by the Census Bureau of housing unit coverage in the 2000 Census estimated that there was a net undercount of 0.61 percent, or about 700,000 units, in 2000. There were some refinements in the address lists and procedures for the latest count. If that meant that the net undercount in 2010 was zero, the implied number of net removals would be higher by about 70,000 per year. If the reported volume of new construction was less than actually occurred, that would also bias the implied net removal value downward. In general, data for housing starts and completions are among the more reliable economic statistics. There was, however, a change in the methodology for estimating the number of new units that produced lower numbers during the latest decade than would have been reported without the change. The most important change, applied to estimates of single-family construction in permit-issuing areas beginning in January 1999, was to remove a 3.3 percent upward adjustment that had been incorporated to account for the possibility of units built (illegally) without permits. If the previous methodology had remained in use, the estimate of construction during the latest decade might have been higher by about 35,000 units per year. It should be noted that on a previous occasion the inconsistency between the growth in the stock, as measured by the decennial census, and the estimates of construction led to a massive revision in the construction estimates. In 1964, the data for housing starts from 1945 to 1958 were restated, raising estimates for the years from 1945 to 1949 by 48 percent, with estimates for other years subject to smaller revisions. If there is an underestimate in recent data, however, the magnitude is almost certainly small. Net losses reflect a number of factors beyond the destruction of houses by demolition and natural disasters. Vacant units that are no longer characterized as habitable are not counted in the stock, even though they haven't actually been destroyed. Some will be demolished later, but others may return to the housing stock. Other losses from, and additions to, the stock occur as structures move between residential and nonresidential use, or are subdivided or merged. Most studies in the past have indicated that changes in use tend to cancel out at the national level, and that net losses are largely driven by permanent removals through demolition and disaster, but that may not have been the recent experience. There are no good, direct measures of either net losses or of demolitions. One type of addition to the stock that is particularly overlooked in the available data consists of the conversion to residential use of structures that had never previously been used for housing. Although conversions of schools, factories, or other nonresidential structures to housing often require extensive construction work, they are not counted in housing starts or completions or in most other measures of residential construction. For California, where the state reports data from the Construction Industry Research Board that includes permits for such conversions, total permits for 2001 to 2010 were 2.6 percent higher than the Census Bureau permit data show. For states like New York the relative share of such reconstruction may be even greater. Even taking all the possible measurement and definition issues into account, it appears that the rate at which units have been removed from the housing stock in recent years has been remarkably low. Along with a rate of new construction that is smaller, relative to the size of the stock, than during most periods in the past, this has meant relatively more older housing. The median age of the stock, as reported in the 2009 American Housing Survey, was 35 years. Although that's a long way from the extrapolated value of 850 years suggested above, it's probably more than at any previous time in U.S. history. As recently as 1985, the median age of the stock was about 23 years, down from 28 years in 1950. With the current large number of vacancies and the lack of maintenance provided to many distressed properties caught up in the foreclosure crisis, as well as the seeming proliferation and severity of natural disasters, losses from the stock might be expected to rise. Indeed, that may be a key part of the process by which supply and demand come back into balance. For assessing the economy, planning business activities, and formulating public policy, it would help if we had some way of tracking this. It has been almost 3 years since I have written anything for this blog. I actually forgot how to do so, and managed to get caught up in various projects. At the moment I have fewer commitments. I only mention this so you know that the reason why the previous post was in 2008 is not a problem with your computer. The ambiguous identification of government-sponsored entities (GSEs) Fannie Mae and Freddie Mac with the government and the private sector has taken on new twists. Loose lips, general uncertainty, and sheer panic have contributed to a crash in their stock prices and raised questions about their previously-sterling credit standing. Fannie and Freddie are required by their government charters to inform investors that their securities are not backed by the government. Investors, however, have generally treated their debts and other obligations as implicitly government-guaranteed, allowing them to borrow at rates only slightly higher than Treasury bond yields. "We don't believe in a 'too big to fail' doctrine, but the reality is that the market treats the paper as if the government is backing it. We strongly resist that notion. "You know that there is that perception. And it's not a healthy perception and we need to disabuse people of that perception. Investments in Fannie and Freddie are uninsured investments." As recently as March of this year, Fed Chairman Bernanke said, "Only if GSE debt holders are persuaded that the failure of a GSE will subject them to losses will they have an incentive to exert market discipline." No protection may be available for the GSEs' shareholders, but it will probably now be demonstrated that their creditors were right to ignore the Treasury and Fed trash talk. While there has been a debate about whether Bear Stearns should have been allowed to default, the danger to the financial system and the economy is vastly greater in this instance. Indeed, the interest rate premium on GSE debt over Treasury bonds actually narrowed last week, when it was recognized how unthinkable it would be to not honor the GSE obligations. The GSEs provide funds for mortgage lending in two ways. They buy mortgages or mortgage-backed securities (MBS) to hold as portfolio investments, financed by issuing corporate bonds, and they provide guarantees against default for MBS that are sold to other investors (or to themselves). Much of the criticism of the GSEs by the Fed, Treasury, and others related to their increased reliance on portfolio purchases rather than guarantees. It was argued, with considerable justification, that holding mortgage assets in portfolio exposed the GSEs to greater risks. It was further argued that they did so to increase profits without lowering borrowing costs for home buyers. In the course of those arguments it was invariably stated that interest rate risk (from portfolio activity) was severe, while credit risk (present with both purchases and guarantees) was manageable and "not a serious problem." The current difficulties, however, are primarily the result of credit risk. Some of those credit risk problems reflect regulatory requirements. Fannie and Freddie are regulated by the Office of Federal Housing Enterprise Oversight (OFHEO) with regard to safety and soundness (although that regulatory responsibility may be shifted to a new agency under pending legislation). They are also subject to regulation by HUD under mandates to serve low- and moderate-income households and neighborhoods. As originators and investors with more energy than brains expanded (subprime) lending to those borrowers and neighborhoods, it was difficult for Fannie and Freddie to increase their shares. The GSEs didn't want to buy or guarantee subprime loans, correctly perceiving them to be insanely risky. Instead they purchased securities created by subprime lenders, taking only the supposedly-safe tranches. Those portfolio purchases were counted toward their obligations to lend to lower-income home buyers, but are now part of the write-downs. On February 13, President Bush signed the Economic Stimulus Act of 2008, which included a temporary increase in the maximum loan eligible for sale to Fannie and Freddie. With that new authority, and with other sources of mortgage credit sidelined, the housing industry, Congress, and the Administration expected Fannie and Freddie to expand their activities. To do so, and to offset losses from write-downs, they would have to increase their capital bases. The regulatory capital requirements to support MBS guarantees are less than those to support portfolio assets, so they can facilitate more mortgage lending by shifting to that line of business, but they still require more capital to continue to fill the void left by defunct or hobbled private conduits. Freddie Mac CEO Richard Syron, however, was under the impression that he was running a private-sector firm on behalf of shareholders. On March 12, he told a meeting of Wall Street analysts that Freddie didn't plan to raise additional capital and thereby dilute the value of the stock, which had already fallen by more than half. That was not well-received in Washington. A week later, Syron joined CEO Mudd of Fannie Mae and OFHEO Director Lockhart to announce a planned expansion. OFHEO increased the amount that the GSE could invest, relative to their capital bases, in part based on the promises to raise additional capital. Subsequently, Fannie--the more politically-attuned sibling--sold some common and preferred shares (less than OFHEO wanted), but Freddie only has said it will raise capital "in the near future." The quasi-public, quasi-private housing GSEs had come to be regarded by many as arrogant, greedy, opaque, reckless, and unnecesary. In current circumstances, "unnecessary", at least, must be dropped from that list. As the housing and mortgage markets have foundered, the FHA (Federal Housing Administration) has suddenly become the focus of a variety of efforts to stabilize the market. It has already filled much of the breach left by vanishing financing sources, but now it is being eyed for more dubious heroics. FHA doesn't provide mortgages, but it guarantees that the mortgages will be repaid, if not by the borrower, then by the government. Although in theory taxpayers are ultimately responsible, the main FHA program is a mutual insurance arrangement under which borrowers pay premiums to insure against their own defaults, potentially receiving rebates of money left over after claims are paid. Unlike conventional (not-government-insured) mortgages, FHA loans may be, and usually are, packaged into Ginnie Mae mortgage-backed securities, which are fully and unambiguously backed by the federal government (on top of the federal insurance on the underlying mortgages). When FHA was created in 1934, it was intended for economic stimulus and mostly insured loans on new homes in segregated communities (see my 1998 article). A few decades later, however, it evolved into a program mainly for insuring mortgages for lower-income, minority, and/or first-time home buyers. FHA-insured loans were available to borrowers who lacked the downpayments and credit ratings required for conventional prime loans. With the rise in subprime lending, especially after 2001, the FHA share shriveled (as documented and analyzed in a June 2007 GAO report). Subprime lenders were willing to accept borrowers that even FHA, with its relatively-relaxed standards, rejected. Subprime loans also, in some cases, offered lower initial payments, but had terms that became more expensive over time. Now subprime lending has dried up, and FHA lending has soared--more than doubling in the past year, despite fewer home sales. The growth is likely to accelerate, moreover, as a result of a sharp increase in the maximum loan size, provided for in the February 2008 economic stimulus package. The "FHA Secure" program provided somewhat more lenient underwriting rules for refinances of conventional ARMs, starting in September 2007, and those rules will be further liberalized in July 2008, promising additional volume, and possibly greater risk. Legislation now under consideration, and apparently headed toward adoption, would create a much more ambitious role for FHA. New loans would be made available to seriously delinquent borrowers facing foreclosure whose homes are worth less than the outstanding balances on their mortgages. The holder of the previous mortgage (aka mortgagee--the lender, not the borrower) must be willing to accept less than the current value of the home as payment in full. The rescued borrower would have to agree to split any subsequent gains from resale of the house with FHA. The previous lender would presumably only agree to such a deal if borrower and the house appeared to be pretty worthless. With the homeowner obligated to share any gains with FHA, there wouldn't be much incentive to improve, or even to maintain, the house. Compounding the adverse selection and moral hazard issues, this would seem to be a pretty difficult program to administer. Desperate times may call for desperate measures, but the congressional plans look a little too desperate. The headline from today's report on new residential construction was the 12 percent drop in housing starts from February to March. The month-to-month change was magnified by a swing in the volatile multifamily data, but the basic message of gloom was not misleading. Single family starts, at an annual rate of 680,000 in March, were the lowest since January 1991. Permit data, builder surveys, and market conditions indicate that this still isn't the bottom. 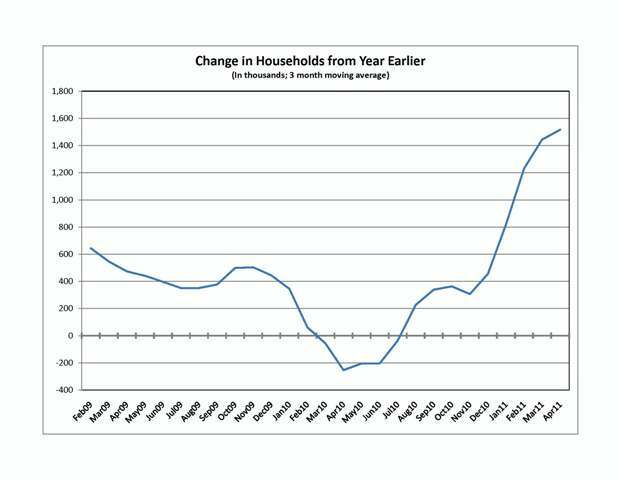 The cyclical peak for single family starts was an annual rate of 1.84 million in January 2006. Even though the contraction in residential construction has extended to virtually all areas and market segments, there are some differences revealed by the data. Multifamily starts, for example, haven't fallen by much over the past couple of years, despite the 25 percent decline in March from a random uptick in February. For the first quarter of 2008, multifamily starts averaged 313,000 at an annual rate, exceeding the annual total for 2007 and not much below the annual total of 352,500 in 2005. This partly shows a failure of condo construction to adequately respond to the severely-glutted condo supply, but largely reflects increased construction of, and relatively-healthy demand for, rental apartments. Among the four Census Bureau regions, the Northeast has experienced the least severe single-family decline, with new home sales down by 20 percent from 2005 to 2007, compared to 40 percent nationally. But with the Northeast accounting for only about 8 percent of new home sales, that doesn't provide much support for the national economy. The steepest regional declines have been in the Midwest and West, where new home sales and single family starts fell by nearly half from 2005 to 2007 and have fallen further in the early months of 2008. As is typical during housing downturns, construction of single-family homes on customers' land has been more resilient than "for sale" construction on builder-owned land. About 20 percent of single-family starts occurred on customer-owned land in 2005, but that share was up to 32 percent by the 4th quarter of 2007. The inventory of new homes for sale has declined somewhat in recent months, down to 471,000 at the end of February 2008, compared to 544,000 a year earlier. That still represents 9.5 months supply at the latest sales rate. Moreover, although there were fewer homes for sale in the construction pipeline, the number of completed unsold homes was up from February 2007. Among those completed homes for sale, the median time since completion was 7.2 months, compared to an already-high 4.2 months a year earlier. And that doesn't include homes with sales contracts that had been cancelled. For aspiring first-time homebuyers, perhaps all this represents possible bargains, although home prices are still much higher than they were five years ago. For existing home owners, the housing and financial industries, and the national economy, the data paint a pretty grim picture. Current production is below the rate needed to accommodate longer-term demand, and eventually that will eliminate the excess supply. The process will take a while, however, especially with a recession likely to constrain new household formations, and with foreclosures dumping more supply on the market. Some of the biggest shocks from the housing correction have been in states where extraordinary growth had seemed perpetual. Nevada, Arizona, and Florida led the nation in housing starts, relative to population, over the past 20 years, and their economies became heavily dependent on home building and other industries related to the absorption of new residents. Employment growth in Nevada exceeded the national average every year from 1984 to 2006. In 13 of those 23 years, Nevada's growth rate was the highest among all states. Arizona and Florida also consistently exceeded the national employment growth rate. All three states have now fallen below the national average. I calculated estimates of state-by-state employment involved in building, selling, and financing housing. Using data from 2005 County Business Patterns (the latest year available for that measure of detailed employment by industry), as well as some other sources, plus some crude but reasonable estimates of the share of employment in various industries dependent on housing, I figured that about 5.9 percent of jobs nationwide were related to housing growth and turnover. Nevada had the largest share among the states, with 9.0 percent, even though the building materials and other inputs used there largely came from other states. New York had the smallest share, at 4.4 percent, according to this calculation. In growth-addicted states such as Nevada, Arizona, and Florida, reduced housing demand means significantly fewer jobs. And with so many recent migrants in the population, the likely impact on outmigration is greater than in states where there are stronger ties to the community. The unwinding of speculation and overbuilding thus translates into further reductions in housing demand. The demand-construction-employment-population-demand feedback loop supercharged home building during their long growth periods, but now it is operating in reverse. Nevada, Arizona, and Florida are not going to become chronic laggards like Pennsylvania or Michigan, but it may take a couple more years before they return to their growth trajectories. Not all the over-achieving states of the past decade with large housing production sectors have been clobbered by the recent unpleasantness. Utah and Idaho, for example, seem to be doing all right. It is not entirely clear why they have been less affected. Maybe people who might have gone to Nevada or Arizona are moving there instead.